Researchers have developed a new design for the framework of columns and beams that support bridges, called "bents," to improve performance for better resistance to earthquakes, less damage and faster on-site construction. The faster construction is achieved by pre-fabricating the columns and beams off-site and shipping them to the site, where they are erected and connected quickly. "The design of reinforced concrete bridges in seismic regions has changed little since the mid-1970s," said John Stanton, a professor in the Department of Civil and Environmental Engineering at the University of Washington, Seattle, who developed the concept underlying the new design. The team members include Professor Marc Eberhard and Graduate Research Assistants Travis Thonstad and Olafur Haraldsson from the University of Washington; Professor David Sanders and Graduate Research Assistant Islam Mantawy from the University of Nevada, Reno. Research findings are included in a paper being presented during Quake Summit 2014, the annual meeting for the National Science Foundation's George E. Brown, Jr. Network for Earthquake Engineering Simulation (NEES), a shared network of laboratories based at Purdue University. This year's summit is part of the 10th U.S. National Conference on Earthquake Engineering on July 21-25 in Anchorage, Alaska. Until now the majority of bridge bents have been made using concrete that is cast in place, but that approach means time is needed for the concrete to gain strength before the next piece can be added. Pre-fabricating the pieces ahead of time eliminates this requirement, speeding on-site construction and reducing traffic delays. "However, pre-fabricating means the pieces need to be connected on-site, and therein lies a major difficulty," Stanton said. "It is hard enough to design connections that can survive earthquake shaking, or to design them so that they can be easily assembled, but to do both at once is a real challenge." Moreover, the researchers have achieved this goal using only common construction materials, which should smooth the way for owners and contractors to accept the new approach, he said. An important feature of the new system is that the columns are pre-tensioned. "A good analogy is to think of a series of a child's wooden building blocks, each with a hole through it," Stanton said. "Stack them on top of one another, put a rubber band through the central hole, stretch it tight and anchor it at each end. The rubber band keeps the blocks squeezed together. Now stand the assembly of blocks up on its end and you have a pre-tensioned column. If the bottom of the column is attached to a foundation block, you can push the top sideways, as would an earthquake, but the rubber band just snaps the column back upright when you let go." This "re-centering" action is important because it ensures that, directly after an earthquake, the bridge columns are vertical and not leaning over at an angle. This means that the bridge can be used by emergency vehicles in the critical moments immediately following the earthquake. "Of course, the real bridge columns do not contain rubber bands, but very high-strength steel cables are used to achieve the same behavior," Stanton said. To keep the site operations as simple as possible, those cables are stressed and embedded in the concrete at the plant where the columns are fabricated. The columns also contain some conventional rebar, which is also installed in the fabrication plant. The technology was pioneered in the building industry in the 1990s but is now being adapted for use with bridges. 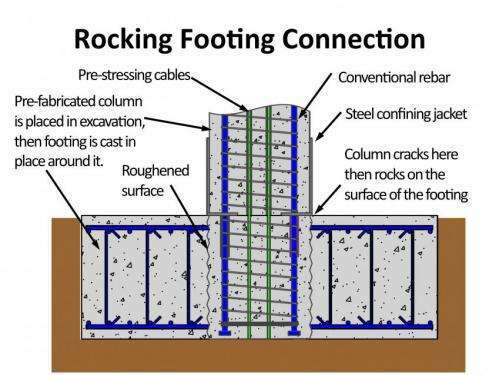 When the columns rock during an earthquake, they experience high local stresses at the points of contact, and without special measures the concrete there would crush. To counteract this possibility, the researchers protected the ends of the columns with short steel tubes, or "jackets," that confine the concrete, not unlike the hoops of a barrel, or the steel cap that ranchers use to protect the top of a fence-post while driving it into the ground. "Cyclic tests of the critical connections have demonstrated that the system can deform during strong earthquakes and then bounce back to vertical with minimal damage," Stanton said. Those tests were conducted on individual connections by graduate assistants Olafur Haraldsson, Jeffrey Schaefer and Bryan Kennedy. In July, the team will test a complete bridge built with the system. The test will be conducted at 25 percent of full-scale on the earthquake-shaking tables at a facility at the University of Nevada, Reno. The facility is part of NEES. Travis Thonstad led the design and built the components for that test. The column and cap beam components were then shipped to the University of Nevada, Reno, where Islam Mantawy is leading the construction of the bridge. The team from Washington and Nevada will be processing the data from this project, and it will be archived and made available to the public through NEES. The team from Washington and Nevada will process the data from the project, which will be archived and made available to the public through the NEES Project Warehouse data repository at http://www.nees.org. The Quake Summit paper was authored jointly by the team. More information: A Pre-tensioned, Rocking Bridge Bent for ABC in Seismic Regions, Quake Summit 2014. A new, rocking, pre-tensioned concrete bridge bent system has been developed that reduces on-site construction time by precasting the beams and columns, minimizes post-earthquake residual displacements by the use of locally unbonded, pre-tensioned strands in the columns, and reduces earthquake damage by means of rocking connections at the ends of the columns. Cyclic tests of the critical connections have demonstrated that the system can deform to drift ratios of around 6% with minimal damage and negligible residual displacements. Shaking table tests of a 25% scale, two-span bridge at the University of Nevada, Reno will be used to evaluate the dynamic performance of the system.